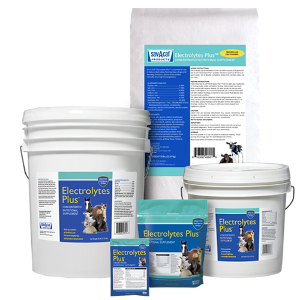 Electrolytes Plus™ is a concentrated nutritional supplement fortified with dextrose, glycine, sodium bicarbonate and lactic acid bacteria to be used during periods of stress. Contains a source of live (viable) naturally occurring microorganisms. For use in pre-weaned veal and herd replacement calves, foals, lambs, goat kids, baby pigs, llama and alpaca crias, fawns and elk calves. Also for use in adult horses, llamas, alpacas, goats, and sheep. Non-medicated, requires no withdrawal period. Balanced levels of essential electrolytes support hydration. Lactic acid bacteria support digestive health. Sodium bicarbonate supports normal blood pH. Dextrose provides a readily absorbed source of energy. Glycine supports efficient electrolyte absorption. Kaolin absorbs toxins, coats and soothes the gut.